(TibetanReview.net, Jul05, 2016) – Tibet’s exiled spiritual leader, the Dalai Lama, on Jul 3 expressed sadness over the passing away of the Holocaust survivor and the 1996 Noble Peace Prize winner Professor Elie Wiesel. He died in New York on Jul 3 after a long illness, aged 87. In a condolence message to Mrs Marion Wiesel, the Dalai Lama said the best tribute we could pay in his memory was to dedicate ourselves to promoting the values he held dear in a spirit of understanding, friendship and brotherhood. “Among his many qualities he was a steady friend of the Tibetan people. I offer prayers on his behalf and my condolences to you and the members your family at this sad time,” he said. 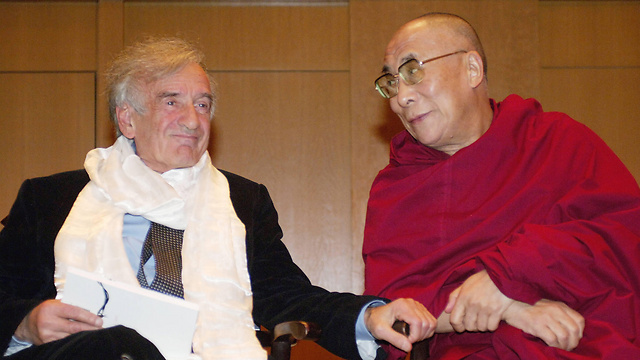 The Dalai Lama said he and Professor Wiesel had worked together with other Nobel Peace laureates in an effort to promote understanding between conflicting parties and to bring about a more peaceful world through dialogue and reconciliation. “We will miss his compassionate, broadminded contribution to our discussions,” he said. Often called the “Conscience of the world”, Professor Wiesel He has fought atrocities and injustice everywhere and written more than 50 books.